One of several dishes at the Canberra Deep Space Network, operated by CSIRO on behalf of NASA. This article originally appeared on news.com.au, published April 25 2017. In a valley near Canberra — better known for its politicians than space exploration — is a hidden complex that will help land the first people on Mars. 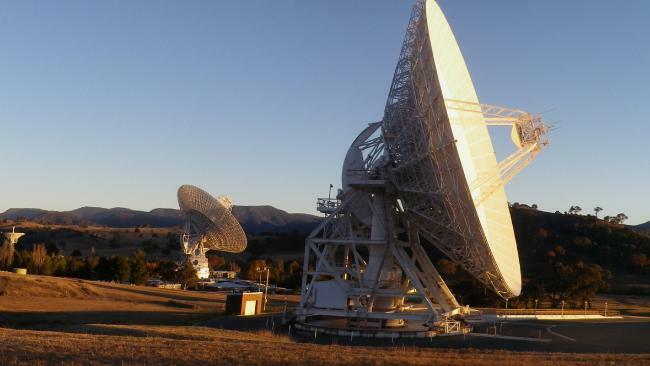 The Deep Space Communication Complex in Tidbinbilla, operated by CSIRO on behalf of NASA, is now home to seven satellite dishes, two command centres and a museum, sprawled out over 157 hectares of land in a lush green valley, about 45 km south west of Australia’s capital city. Streets that run through the site have space themed names, including Planetary Rd, Voyager Rd and Deep Space Loop. Access to the compound, which is mostly restricted to the public, is via a long and winding road through immaculate countryside where sheep dotted hilltops touch the clouds and autumn leaves flitter around freshwater lakes. But the location of the complex — on land leased by the ACT government — was not chosen for its beauty. The hills surrounding the valley shield it from “line of sight radio noise” caused by electronics including mobile phones and televisions. This noise has the potential to interfere with signals transmitted between the satellite dishes and spacecraft “hundreds of billions of kilometres away”. Mobile phones on site must be switched to ‘flight mode’. A ‘no-fly’ zone for aircraft is in place with the exclusion area spanning 15 km. Among the approximate 90 employees who make the breathtaking journey to operate and maintain the site each day are technicians, administrators, engineers, and logisticians. Once there they spend their days in constant talks with all of the world’s deep spacecraft. 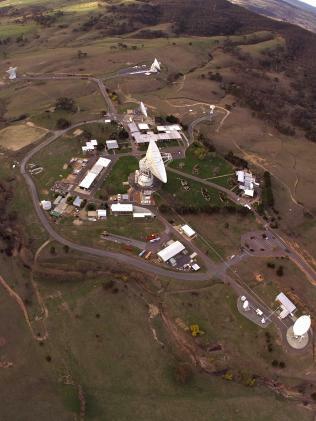 “We have to operate 24/7 like a small town,” said CSIRO NASA tracking station spokesman Glen Nagle. 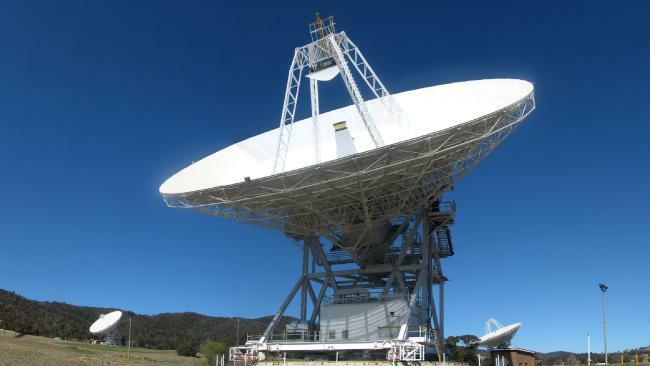 Canberra Deep Space Network, operated by CSIRO on behalf of NASA. Dish #43. Source: Supplied. “[Our main responsibilities are] handling requests from missions to transmit specific data, commanding spacecraft to do a particular thing, making sure the flights get there and the information gets back again,” he said. The data transmitted from deep space to the complexes include everything from photographs of new worlds to live communications from astronauts. “Spacecrafts are basically like little science labs, they have cameras on board, instruments to study the atmosphere of a planet, its gravity, surface mapping, composition of the surface and so on,” Mr Nagle said. “Three of those planets are in the habitable zone. Potential worlds that could possibly support life. 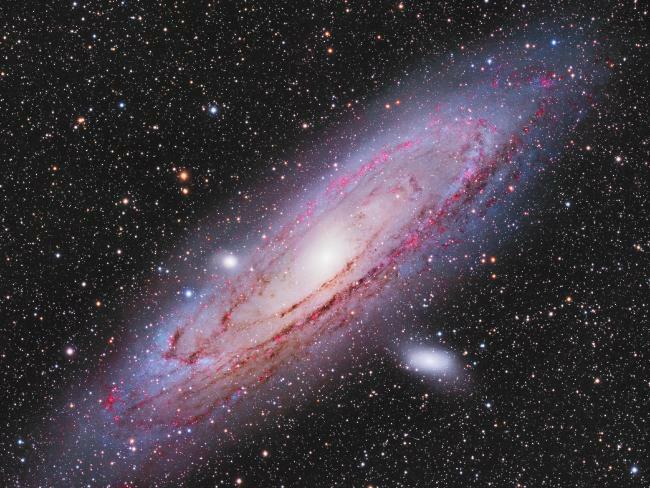 The M31 Andromeda Galaxy, M32 and M110 Galaxies in deep space. Picture: Kayron Mercieca. Source: Supplied. As of November this year they will take turns at having full control of all three of the world’s deep space complexes for one third of each day. 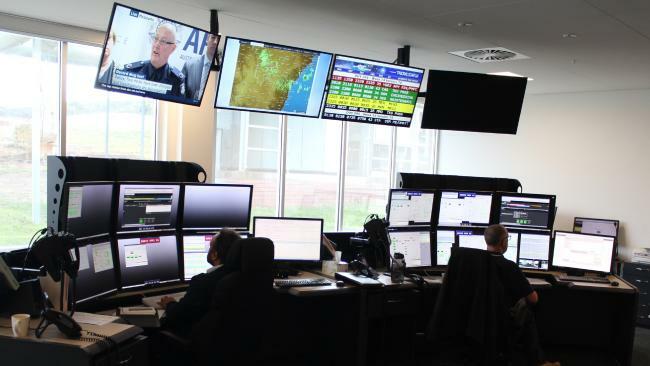 Australia will effectively be in charge of communications between every mission in deep space and Earth during daylight hours on the Eastern seaboard. It’s a big responsibility. The complexes are currently handling 44 missions in deep space for NASA, India, Japan and “all the other European Space Agency nations”. “There are eight missions at Mars at the present time: six in orbit, two Rovers operating on the surface; a Japanese mission at Venus; four spacecraft at the moon; a mission in the asteroid belt orbiting around the dwarf planet ceres; a mission at Jupiter which just did its closest fly-by of that planet; and five deep space telescopes”. Among other long term missions the team is still “talking to” are Cassini at Saturn, and the twin Voyagers in deep space, 13 and 39 years on from their launch dates, respectively. 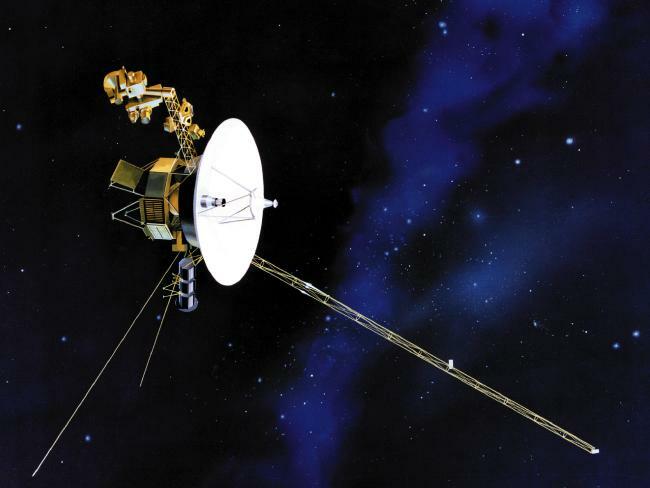 “The Voyagers are now the most distance spacecraft from the earth,” Mr Nagle said. An artist’s rendering shows one of NASA’s twin Voyager spacecrafts. The long-running Voyager 1 spacecraft has been hurtling toward the edge of the solar system since 2004. Picture: NASA. Source: Supplied. 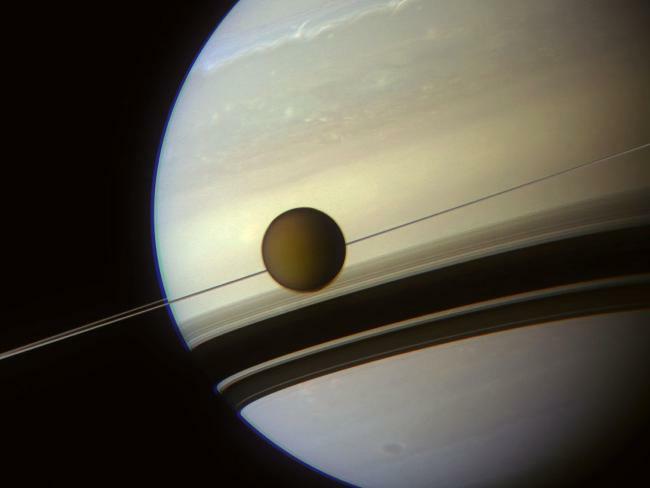 Saturn’s largest and gaseous moon, Titan, from NASA’s spacecraft Cassini. Picture: NASA. Source: Supplied. Juno was more than 867 million kilometres from the Tidbinbilla site when it received the first faint signal tones from the solar-powered spacecraft. 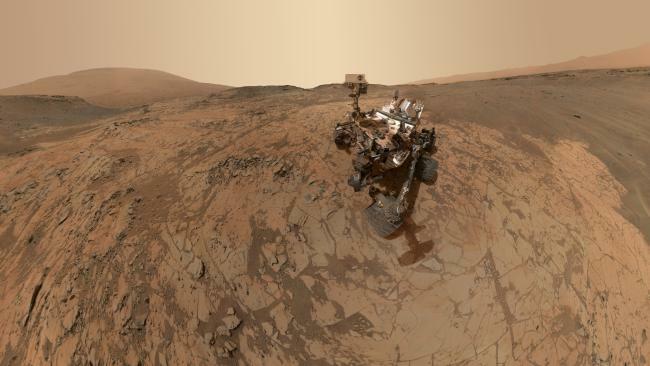 NASA’s Curiosity Mars Rover took dozens of images of itself that were combined to create this history-making selfie, posted to the mission’s Facebook page with the caption “Hello, Gorgeous!” The nuclear powered Rover has been busily reconnoitring the planet since August 2012. Picture: NASA. Source: Supplied. “Nobody goes anywhere, does anything, gets their commands out there or back without us, Mr Nagle said as one of the satellites started receiving signals from a spacecraft orbiting Mars. “You can launch as many spacecraft and rockets as you like. But if you haven’t got anyone else here to talk to it you’re just sending out junk. According to Mr Nagle, the Australian operated facility is fully funded by NASA and costs about $20 million per year to run. 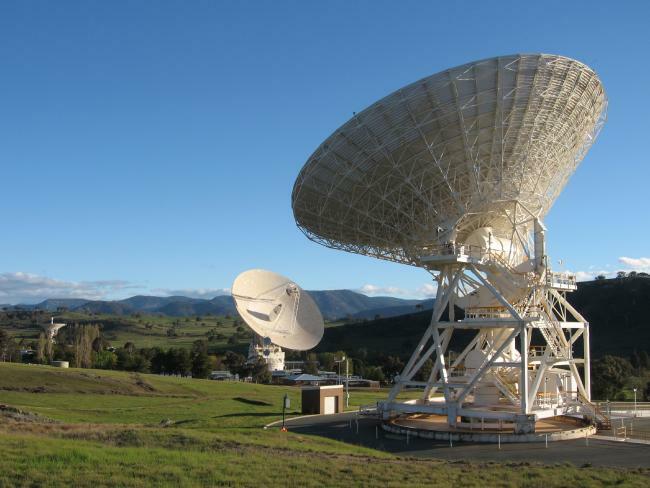 The views from the new command centre at the Canberra Deep Space Network are like no other. Source: Supplied. The CDSCC and its smallest satellite dish helped land the first astronauts on the moon, famously receiving images of the milestone before anywhere else in the world. The complex is expected to play a similar role in the first manned landing on Mars. But it’s come a long way since it opened in 1965 and astronaut Neil Armstrong four years later took his first steps on the moon, declaring: “one small step for man, one giant leap for mankind”. “There are eight spacecraft right now and another nine missions planning to go to Mars just by 2020,” Mr Nagle said. 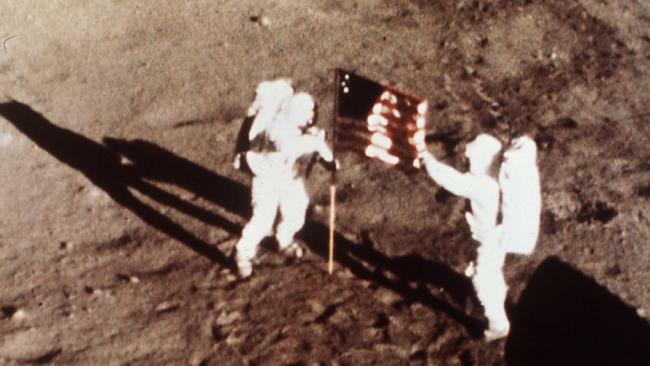 Apollo 11 astronauts Neil Armstrong and Edwin E. “Buzz” Aldrin, the first men to land on the moon, plant the U.S. flag on the lunar surface on July 20, 1969. Picture: AP/NASA. Source: News Limited. One of the satellite dishes is the largest in the Southern Hemisphere. Two of them are brand new. “Having these new dishes is a first step in getting the ball rolling [for man to land on Mars],” Mr Nagle said. “When those spacecraft transmit to us those signals might be no stronger than the power that’s used by a mobile phone,” Mr Nagle said. “But by the time we receive it on Earth it can be 20 billion times weaker than the power of a watch battery. 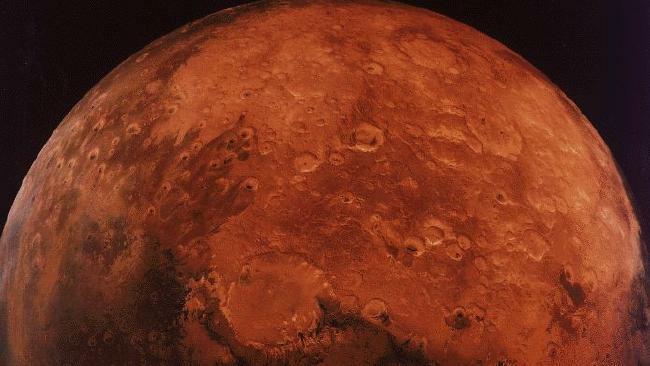 The first manned mission to planet Mars will take place at the earliest in 2021. Source: Supplied. “We train for every possible scenario as disaster planning and run simulations,” Mr Nagle said. But according to Mr Nagle its unlikely the words ‘Canberra, we have a problem’ will ever be uttered from deep space. “Very little can go wrong (in terms of deep space communications),” he said. Mr Nagle said that Australia “doesn’t think of itself as being a space faring nation” but that it was wrong. “We’re incredibly vital in the understanding around us to radio astronomy and optical astronomy,” he said. “Everything anybody has ever seen or heard about space, all the stuff we teach to our kids in school, everything that’s come from a robotic spacecraft in deep space or a human mission to the moon or a deep space telescope clicking off at the rest of galaxies and stars out there, has all come from the work we do at the Deep Space Network, via our antennas here in Canberra and our sister stations in Spain and California. We’re at the forefront of astronomy and space science in Australia, find out more about how we’re exploring the Universe. My second ❤️ is science and science fiction, after having spent 40 years in CSIRO’s Division of Soils I have been rather earth bound. Must visit Tidbinbilla again it have been 30+ years since my last visit. Please tell me why Mars, I have been under the impression the it is a rather inhospitable plane. Keep keeping us in the loop. Thank you for a great article. I am amazed at the extent of the current space exploration activity and equally amazed at the disinterest by the ordinary media sources. However one thing puzzled me. 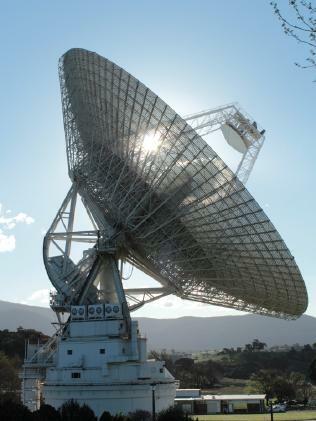 At the time of the first Moon landing, we were all told (at the time of the Moon landing; irrespective of the movie “The Dish”) that the transmissions / images were received by the Parkes Radio Telescope and it was at the time the largest such facility, not from Tidbinbilla. Which is correct? Yikes! I just thought NASA were just putting out the idea of someone travelling to Mars. What a great idea, but what will it do to bring about peace in Syria, Iraq, Afghanistan, ease tension with North Korea, and overcome the frequent famines around the World? The huge rocket needed to lift the spacecraft will add so much heat to the already overheating atmosphere. Then come to think about it, may be NASA could offer to put President Kim Jong-un in charge of the spacecraft and then lose the signal when it gets to Mars. Yikes – thanks Phillberrie and Peter for picking that up!